Hire a car at Edinburgh, Glasgow & Prestwick Airports, Waverly Train Station or Rosyth Ferry Terminal - Arnold Clark car hire is often the lowest cost option - the service level is high. Arnold Clark Telephones are available at Edinburgh, Prestwick & Glasgow Airports. Hire car drop-off and collection at Airport. 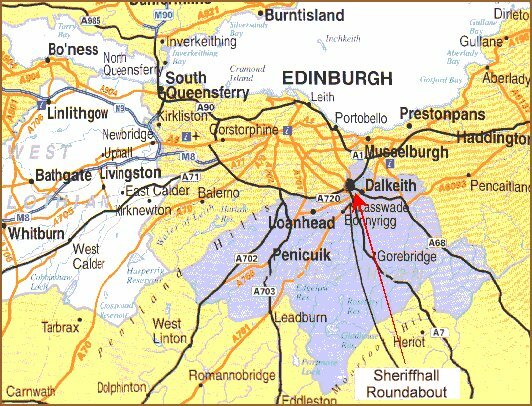 Easily transfer from Edinburgh Airport or Train Station to your ESKBANK Luxury Edinburgh Self-catering holiday apartment. To agree meeting point and to ensure mutual recognition in the airport or station. Your cell phone no. is a good idea! To promise to call United Private Hire if you miss the plane /train. Car Hire however will ensure you have extra holiday / vacation experience options. Distance = 7 miles time 15-20 minutes. Most FLY-DRIVE holidaymakers for AEM Edinburgh holiday apartments will arrive at Edinburgh Airport. You should proceed to DOMESTIC ARRIVAL area. There you should locate "Off airport car rental Courtesy telephones". FIND ARNOLD CLARK PHONE. Push Button and announce your arrival - quoting your RESERVATION NUMBER. 10 Minutes after your call an ARNOLD CLARK DRIVER will MEET YOU AT BUS STOP 14 to transfer you to the nearby car hire office. FREE TRANSFER TO FROM AIRPORT! The last courtesy pick up minibus will be half an hour prior to closing time To avoid confusion , those flying to Glasgow should specify whether it is Gl- Prestwick or Gl- International. 5. Unlimited mileage 4 days +. Baby Seats Free. 7. Insurance excess - £100 . £250 for group vehicles 7,8,9,10. £500 for a 4X4. 8. Appropriate Dr' Licence ( NB if new UK L' - both plastic and paper parts required)/ Proof of residence eg utility bill or Passport. Overseas drivers req. passport & valid Int' licence or Domestic licence. 11. 15 seat Minibuses require category D Driving Licence. Most Europeans and some US don't have - if in doubt check first!! 12. AEM Apts car Hire agency has summarised/ abbreviated information from Arnold Clark car Hire at Feb 2005. The AEM Apts agency is not responsible for changes to terms / conditions and while every effort is made to ensure accuracy , The AEM Apts cannot warrant accuracy of the above published information. You should ask the the AEM Apts agency when in doubt. Note: car hire at the outset of your holiday will only work if you arrive within Arnold Clark Office hours. AC airport offices remain open until 20.30 hours. Out of hours car hire commencement incurs a surcharge, but is possible. You will need Driving Licence ( showing manual or automatic qualified) Proof of residence e.g. passport / Phone bill and cr. card.